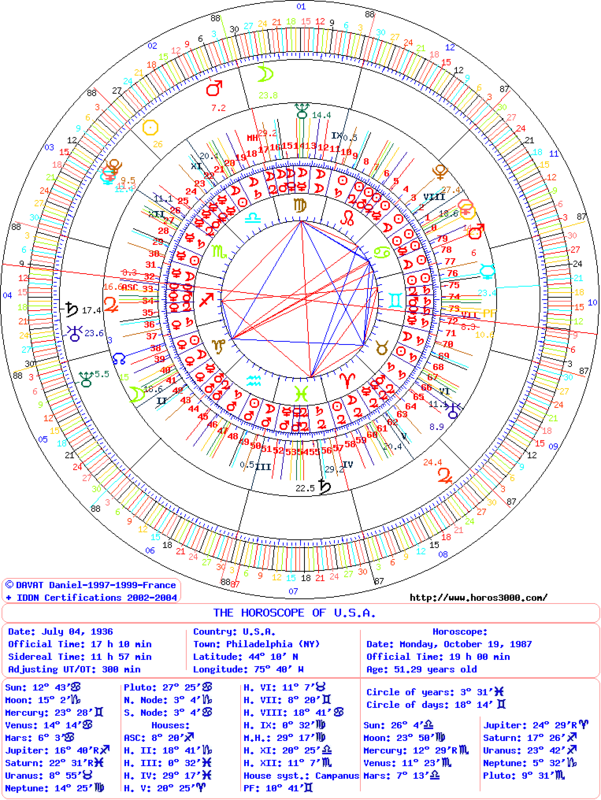 For worldwide astrology, I use the birth chart of the Declaration of Independence of July 04, 1776 of USA. The dating of the 360° of the zodiac is done for a duration of 80 years. The charts are created for the years 1776, 1856 and 1936. Black Monday on October 19, 1987 Dow Jones closed with 22,60% down. It is the most important fall of the Stock Exchange of Wall Street in one day for 20th century. This event is caused by political decisions and are not structural as in 1929. In 1986, the American autorities decided fall of the dollar which losed almost 50% of its value. In 1987, they imposed the opposite by increasing the interest rates. The Government loans, which are without risk, reached 10% of guaranteed output. This rate caused a passion for these placements and the brutal fall of Stock Exchange. Moon situates near the House II, that of money. It has a Evil quality (in Capricorn with Detriment) and has a Powerful force. Saturn is governor of House II. It has an Evil quality (in Pisces) and a Powerful force (near House IV). Mars is governor of House II. It has a Very Evil quality (in Cancer its sign of Fall) and a Powerful force (conjunction with Sun). Sun is governor of House V, that of speculation. It has a Middle quality in Cancer and a Powerful force. Mercury is governor of Part of Fortune. It has a Very Beneficent quality (rulership of Domicile in Gemini) and a Very Powerful force (conjunction with the Part of Fortune). This event corresponds to 51,29 years and the period Mars/Moon. Mars has a Very Evil quality in Cancer. It announces a degradation of fortune during this decade. Moon has an Evil quality and that predicts financial losses during the small period. Both passed in the Midheaven at the date of the event. The losses were important, but the crash was controlled. That is indicated by the position of the day of the Horoscope with 18°14′ of Gemini in conjunction with Part of Fortune and its governor Mercury (of Beneficent quality). The American banking structure did not break down as in 1929. Why this bankruptcy did occur at this date? One notes that the degree of the day of the Horoscope (18°14′ of Gemini) positions to one degree close to Saturn opposition in transit (17°26′ of Sagittarius). This astral position of Mercury-Part of Fortune in Gemini means (into the two charts data): The customers (Mercury the god of the trade of ancient times) of the American State (charts of USA) by financial contracts, the Government loans (Mercury governor of PF and unites with PF in House VII, that of the contracts) are favoured (Beneficent quality). Energies are the same ones, that is to say 51 years and the period Mars/Moon. 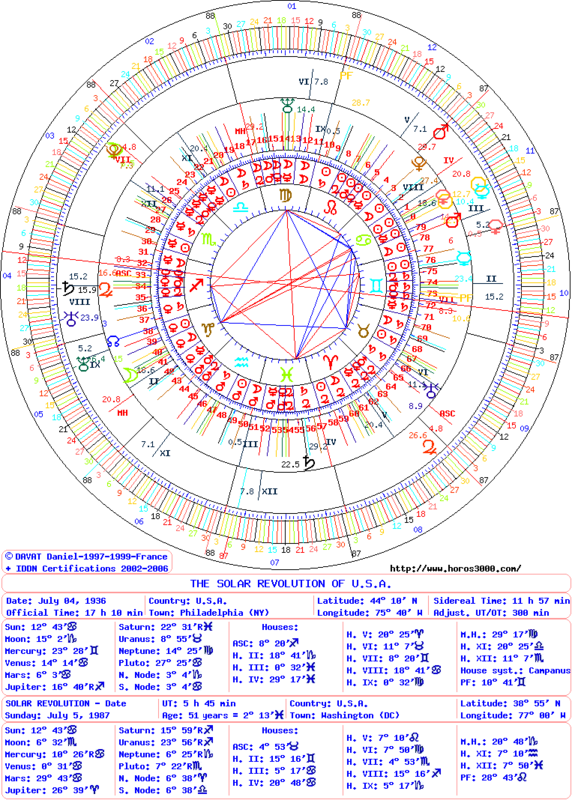 Natal Moon takes powerful with its conjunction with Midheaven (of SR). Moon with its transit takes powerful with its conjunction with House VII (of SR). It is unites with Pluto and with natal House XII. Mars with its transit increase its force by its conjunction with House IV (of SR). It is unites with natal Pluto and with natal House VIII. These three energies are dissonant. All these energies of powerful forces and dissonant qualities presaged important financial losses connected to the Stock Exchange, because the natal Moon is opposed to the Suns. This opposition means the end (Sun unites with natal House VIII and of middle quality) of the benefit (the Moon near natal House II) of Stock Exchange speculation (Sun governor of the Houses V). This entry was posted on Thursday, July 26th, 2012 at 9:37 amand is filed under Finances. Both comments and pings are currently closed.